Hanoi (VNA) - Despite stagnation in the second quarter of 2017, Vietnam’s steel industry managed to turn a profit in the first seven months of the year, led by a rebound in construction and real estate demand. According to reports released by the Vietnam Steel Association (VSA), the domestic steel market in the first seven months of 2017 grew significantly from the same period last year. In particular, 9.5 million tonnes of steel was produced, with 7.8 million tonnes sold domestically, both increasing 11.7 percent. 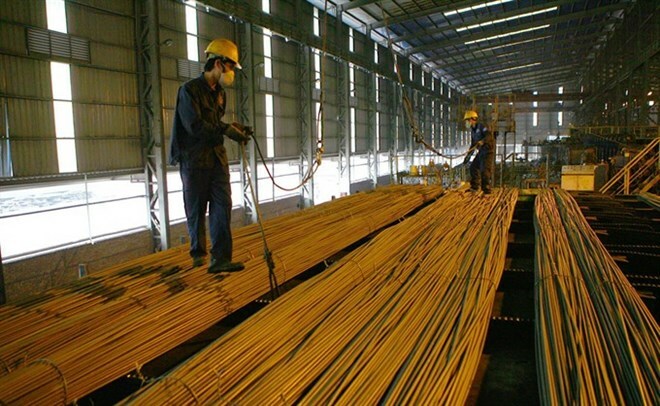 Nonetheless, individual businesses reported second-quarter income below the same period in 2016, including the Tienlen Steel Corporation with income of 178.8 billion VND (7.9 million USD), down 30 percent year-on-year and the Thai Nguyen Steel Corporation at 83.34 billion VND (3.7 million USD), down nearly 48 percent. In total, accumulated post-tax income for Vietnam’s steel industry in Q2 of 2017 was 1.916 trillion VND (85.4 million USD), down 32 percent from 2016. Few firms reported an increase in revenue in the period, with one example the Vietnam – Italy Steel JSC recording more than 3.9 billion VND (173,843 USD), 70 percent higher than 2016’s number. At least 76 steel making firms noted in their financial report for the second quarter of 2017 that their post-tax income fell, including big names like Hoa Phat Steel JSC or Nam Kim Steel JSC. The drops can be attributed to exchange rate fluctuations and hikes in cost, pushing output prices higher, explaining the fall in revenue despite the production increases. For instance, SMC Trading Investment Joint Stock Company reported a 40 percent increase in selling price, with revenue falling 73 percent to 45 billion VND (2 million USD) from 2016’s second quarter. Similarly, the Vietnam – Germany Steel JSC suffered from a change in exchange rate between Vietnamese dong and US dollar, as it increased from 22,275 VND per one dollar in 2016 to 22,750 VND in 2017, making the company’s revenue drop 50 percent to 12 billion VND (534,902 USD) in the second quarter of 2017. However, thanks to many firms earning big in the first quarter of 2017, with at least nine steel producers reporting an increase in revenue of up to 600 percent from 2016’s first quarter, the total accumulated post-tax revenue for the first six months of 2017 reached 4.3 trillion VND (193.6 million USD), an increase of 9 percent from the same period in 2016. The VSA report also cited the introduction of the Ministry of Industry and Trade’s safeguard measures for Vietnamese steel industry driving the rise in production and selling steel and steel related products. Nguyen Van Sua, VSA Vice Chairman, said at a conference earlier this year that in the next five years, the growth rate for the steel industry will hit 12 to 15 percent annually, with the rest of 2017 set for rising productivity.